Considerable advances in automobile and communication technologies have transformed the on-board diagnostics (OBD) aftermarket market into an extremely lucrative industry vertical, building a standardized interface for connecting a vehicle’s computer to external services. As the electronic systems within cars have become more sophisticated and computerized, software solutions have become critical in identifying and fixing critical issues as well as to improve vehicle performance. The OBD aftermarket market is crucial in providing data associated with a car’s fuel economy, acceleration, average speed and power output. Several application areas such as fleet management software and usage based insurance (UBI) schemes require similar information from a user’s vehicle to determine appropriate strategy or pricing. Touted to be a USD 500 million industry in 2017, the OBD aftermarket will experience augmented growth from the rapid expansion of the automobile sector. 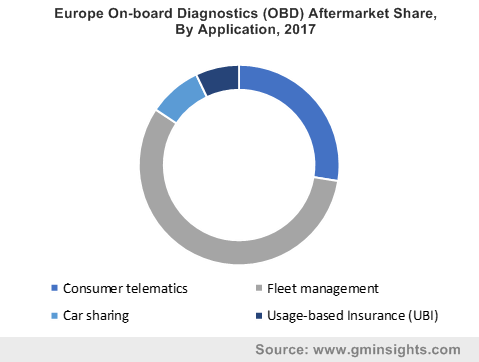 With a number of major automobile manufacturers and world’s leading insurance providers situated in Europe, the region has witnessed a fast-paced adoption of on-board diagnostics services in the usage based insurance application. For the first five months of 2018, it was estimated that nearly 6.88 million passenger car registrations were recorded in the EU, including U.K., which saw a total of 1,079,049 new registrations, representing the enormous demand potential for the OBD aftermarket market. Add to it, the unprecedented rise in on-board telematics solutions and cloud based technologies has positively affected the acceptance of UBI policies amongst younger drivers. This has been achieved by the availability of mobile applications being provided by insurers that enable easy transfer of data from OBD system to the insurer, where cloud solutions deliver a faster risk assessment and pricing service. To elaborate, the speed, average time and distance driven, and other similar parameters can be analyzed to calculate premiums more accurately as compared to demographic profiling, while customer insights concurrently help companies to devise better marketing campaigns. Prominent insurers have utilized the services of OBD aftermarket players for implementing such policies to attract and retain customers of different age groups. In UK, drivers in their 20s are charged about £1,036 on an average, which is higher than those in their 30s due to the increased risks associated with younger drivers. Similarly, people over 50 years old are also charged higher premiums with the amount increasing significantly in their 60s. Direct Line Group’s Privilege brand uses one of the innovative solutions to target drivers between 18 to 20 years of age, using an UBI tool. Speaking about the motor insurance provided by Privilege, it employs DriveXpert for rewarding safe drivers with discounts on their car insurance, demonstrating a significant progression in the on-board diagnostics aftermarket product offering. As part of the scheme, a driver opting for DriveXpert will be posted a small black box which after plugging into the car will provide telematics information including the speed, braking, acceleration and cornering. Users can check their driving scores and at the time of renewal can expect a discounted premium based on safer driving, as well as get tips on how to become a safer driver. Various other insurers in Europe and around the world feature similar of even advanced services to offer UBI packages, boosting the OBD aftermarket market penetration. It is expected that in future, telematics assisted insurance and analytics will result into lesser confusion among customers regarding the products they are buying and allow for a transparency in pricing, along with reducing fraudulent claims. Owing to the fact that insurance premiums will be based on personized vehicle and driving data instead of the averages from thousands of drivers, the worldwide OBD aftermarket from UBI applications is estimated to show a 20% CAGR over the 2018 to 2024 timeline. The OBD aftermarket market can become even more suitable for selling UBI derived policies with the rising sales of electric vehicles globally. As per a recent test survey, it was revealed that a U.K. male aged under 25 was quoted and annual premium of £1484 for a petrol car, £1592 for a diesel car and an astounding £1854 for an electric vehicle (EV). If compared to an older driver, the prices would certainly drop but the price differences for the different types of vehicles will continue. Here, effective UBI offerings given to drivers on the basis of their vehicle’s OBD system will help to decrease annual renewal premiums due to safe driving and result into substantial overall cost savings. The continuous development in on-board technologies and connectivity for EVs will thus offer more flexible options to insurers and drivers, generating additional revenues for the OBD aftermarket market.